I’ve always wanted to raise children who love to read. I believe that reading and continuing our education are very important habits to develop and cultivate in life. Capabilities, knowledge, and skills are empowering—especially in this day and age. In our book, Living a Rich Life as a Stay-at-Home Mom: How to Build a Secure Financial Foundation for You and Your Children, we share the well-known story of Ben Carson. Ben went from a very disadvantageous situation as a youth and became an incredibly talented and successful neurosurgeon. He received the Presidential Medal of Freedom. His success is due in part to his mother’s insistence that he and his brother spend a large amount of time in the library reading. Ben Carson’s mom shared that her idea to have them read and go to the library often was sparked when she realized the successful and wealthy people she cleaned house for all had large libraries. Because I’m very concerned about my children’s futures, I’m trying to instill in them a love for literacy and learning even at a very young age. I began reading to my son at about 3-4 months old. I have continued reading aloud to him, and now his sister, regularly. Ideally, I try for 30 minutes a day. Sometimes I manage more and sometimes less. 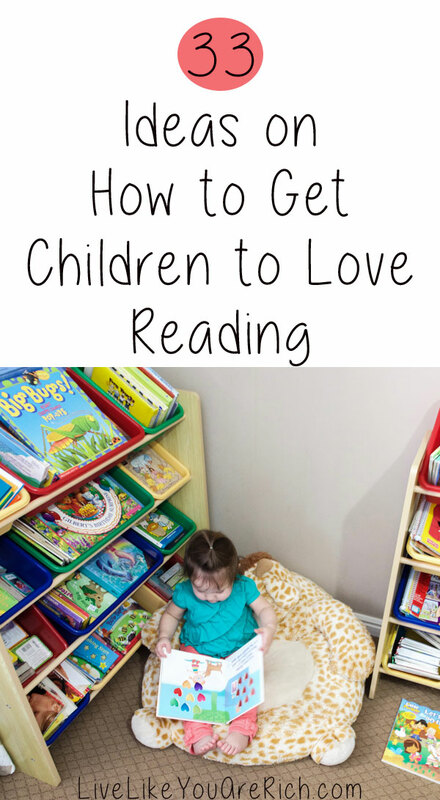 Here are a 33 tips I’ve learned during the past three years on how to get babies and kids to love reading. 1- Read often, not just before they go down for a nap or go to sleep. While I love a goodnight story, reading in the day and at different times helps them to recognize that books can be read anytime and aren’t just a precursor to sleep. 2- Keep reading if they wander away. Babies, toddlers, and kids have short attention spans. I used to get frustrated when, in the beginning or middle of a short book, my son got up and wandered away. I mentioned this to my friend one day, and she said she just keeps reading and they eventually wander back. So I’ve been doing it. Continuing to read usually works, and even if they don’t wander back and sit on my lap, they are hearing the words and seeing that mom likes to read. 3- Allow them to play with and handle the books. Except for fragile, expensive, or meaningful books (we have 5-10 out of hundreds), I allow the kids to play with, handle, and use the books. My opinion is that they really should not be punished for innocently tearing a page, or pulling too hard on a flap and ripping it up. Once they are older, then yes, but at this young toddler/baby stage, I don’t want them to associate using books with punishments/discipline. There are tips in this post on how to fix up books that have been damaged. 4- Have a variety of books. 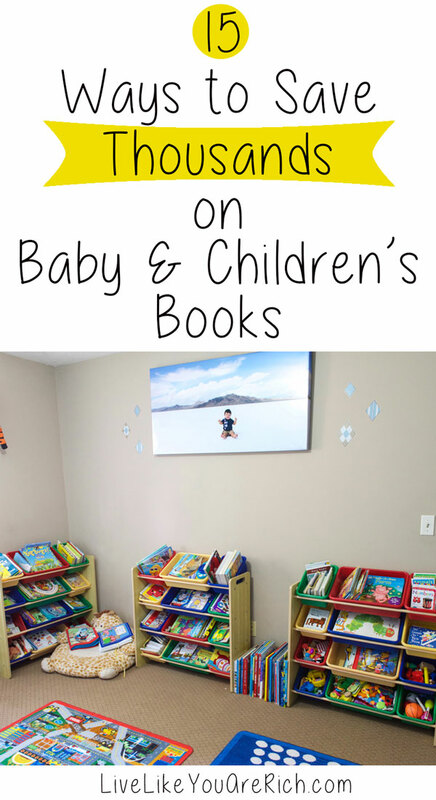 In this post I talk about 15 ways to save thousands on baby and children’s books. I have planned multiple posts addressing the types of books that children of different ages love. I will include lots and lots of examples. Check back in the next few weeks for these posts. 5- Parents, grandparents, and others should be encouraged to read aloud to your children. My kids love it when dad reads to them. My mom is great about reading aloud to her grandkids. It shows them that those they love and who love them also love books. I feel this is a very powerful message for them to receive. 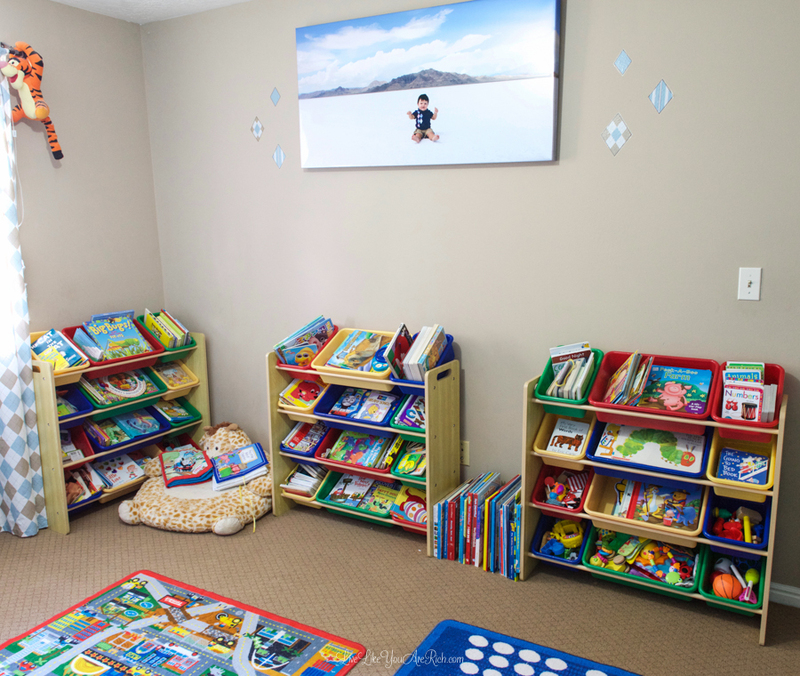 6- Have books in their play areas and other areas of the house. 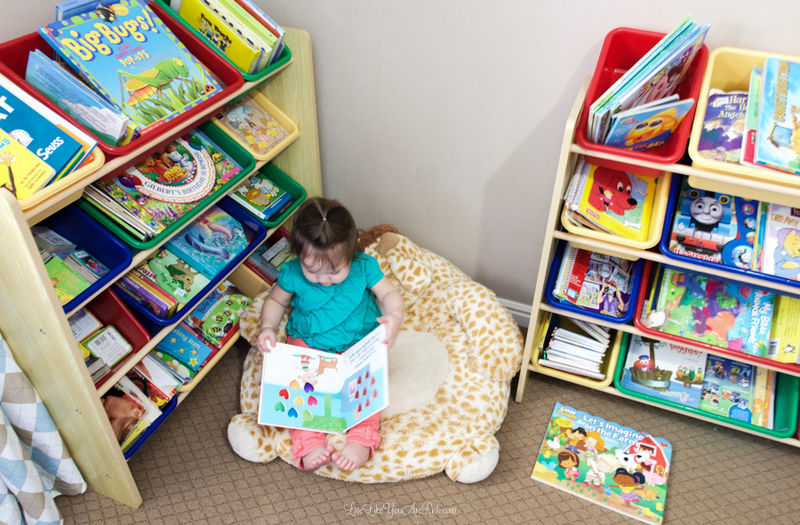 I like to mix books in with their toys and definitely have them as a major part of their play room, bedrooms, and in other areas of the house. I think it is pretty explanatory that if you have books around a lot, they will see and probably read them a lot. 7- Read aloud with their friends too. Often during Denali’s playdates, when his friends or cousins are over, I’ll read a book or two aloud to them. It’s cool to see their friends’ interests and perspectives during this type of peer reading experience. 8- Use a variety of voices. Keep it interesting with tone, pitch, accents, volume etc., as you read aloud. 9- Move your legs up and down (if they are sitting on your lap) with the beat or applicable parts of the books. For example, in the book Chica Chica Boom Boom I bounced my legs a little as I’m reading the catchy words and then when it says, “Chica Chica Boom Boom” I bounce my legs up so high that my kids almost fall off. They laugh, I laugh and we love it. When I read, “Hand, Hand, Fingers Thumb” I read it in a deep drum like tone and bounce my legs (with them sitting on my lap) a little and gradually bounce them more and more as the volume increases in my voice. I feel such joy when I see their faces light up as the story progresses. 10- Tell and show them how to use interactive books. Many books I love have different ways to interact with them. Show them by doing it, and allow them to try before turning the page. There is no rush to get through the book. 11- Read your favorite books aloud. I often read Crown on Your Head, You Are Special, or I Love You Forever (I may or may not shed a tear or two reading these aloud) while my kids are playing. Or if I’m in a less sentimental mood, I’ll read fun books and poems like Where the Sidewalk Ends and some of the others in the photograph below while they play too. I think it teaches them listening skills and also that mom enjoys reading herself. 12- Sing the book lyrics/words. If I can sing to a book, my kids love it. Even if you don’t have the best voice most kids love hearing their parents sing! 13- Give books as presents and gifts. Santa brought some of my children’s favorite books this year. They also get really excited when we receive books as gifts from family! 14- Read adult books so that your kids can see you read for enjoyment too. I’m often on my Kindle app, but I’m making more of an effort to read paperbacks so they notice I’m reading and not surfing the internet. 15- Take books on road trips. Caution- take ones that are durable. When we go on road trips, I like to take books and allow them to read and look at them for a portion of the drive. Just take hardback durable books that can hold up on a trip. 16- Take books to Church or other long meetings. Our kids like to look at books during the Sacrament meeting at our church. The meeting is just over an hour long, so anything to help them stay occupied (and quiet) is really great. Books are very helpful for this. 17- Paraphrase books that may be too advanced or wordy. I often read books that are above their age level and just paraphrase the long paragraphs to keep their attention and help with understanding. This makes them more focused on the story. 18- Point out objects as you read. It makes reading less foreign for them if you are showing them items that they know and recognize. 19- Mix up playtime and reading time so that they get the idea that it is all one fun experience. By making reading part of play time and play time part of reading time, it is all just one big fun experience for them. 20- Pack some small books in your diaper bag for times when you need entertainment. When I need to wait in line, or if something else comes up, I like to be able to hand them a book to look at. 21- When the time comes, or if you have concerns, check that their vision is good and/or get them glasses. Children with vision problems have difficulty reading or being read to. 22- Have them read to each other. I ask my son to read beginning-age books to his little sister. He points out horse, tree, honeybee, etc., and essentially reads to her, and I praise him highly for it. He feels a sense of accomplishment, and she sees that her brother is reading to her. 23- Have them turn the pages when they are ready. Sometimes my kids will want to look at a page for a split second, other times, they’ll want to stare at it. I’ve found if I put my thumb under the next page so that they can easily grasp it and turn it when they are ready, they do so at a pace they set. Have the books organized and accessible. This way you can find what you are looking for and your children can see what is available. 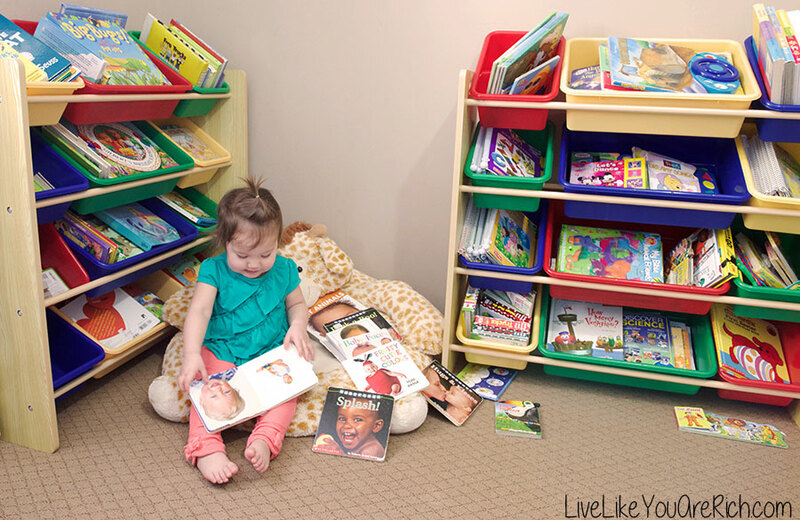 I use these kid organizers and they work great! The kids have easy access to them and we are able to group them according to age, interest, and the type of book it is. 25- Read at family dinner. “Every evening when we sat down to eat, we blessed the food, ate, chatted, and then my parents would ask us what we learned that day in school. We would all take a turn telling what we learned (Sunday’s we told what we had learned during church). At the end of the meal we each read a scripture or two from the Holy Scriptures and passed it around, usually reading about a chapter before we could be excused.” Although that type of schedule may not be for you, you could incorporate something similar by reading a book during your family meals. 26- Listen to books on tape or read aloud on road trips and in the car. My cousins’ parents were so awesome at this. Every road trip the parents would read classic books to their children while traveling. I love books on tape—it makes the time fly by. Reading and listening to books read aloud increases general knowledge, listening skills, and focus abilities for kids. 27- Let them read different books at the same time. During reading time today, my son was reading a book as I read another one to my daughter. I was reading aloud a little animal book, and my son was reading about different animals. While it got a little confusing, it was fun to hear him calling out different animals while I was saying the ones my daughter was reading. Keep it relaxed and chill so they enjoy the time. 28- Let them pick out the books. I always tell them to pick the books (at least at the beginning of reading time), then sometimes I’ll just grab one we haven’t read for awhile or that I know they’ll like. If you go shopping for books, having them pick one out could be fun for them too. 29- Take them to the Library. I still vividly remember my mom taking me to the library reading time as a toddler/young child. Taking them to different fun events at the library encourages a love for books too. 30- I let them take books to bed. This of course is your personal preference, but my son likes to take a few books to bed at night. Instead of a blanket or stuffed animal he holds a toy or often books as he dozes off. I’m not sure how comfortable this is for him during the night, but he sleeps great, so we’ve just rolled with it. 31- Use books as incentives. This may not work for every child, but if you say, “Help Mommy with this and then you can pick a book to read,” that puts reading on a totally different level. Reading becomes a reward and something they work for, which are both great things to instill in them while they’re young. 32- Create a comfortable sitting area. Denali got a floor pillow for Christmas a few years ago from my aunt, and it has been the perfect place to sit! It encourages us to sit and read because it is comfy and close to the ground. I cross my legs so both kids can have a seat on each one. 33- Expect different reactions during different stages of life. There was a period of time when my son would sit on my lap for quite awhile if I was reading the right types of books. He was very entertained. Then he hit an age where he just wasn’t interested. I read aloud to him anyway (he was in the same room but not actively participating). A few months of this and he regained his love and attention to books. And so it goes with our children. They go through phases. Stay fairly consistent—even if they aren’t interested, and hopefully you’ll find, as I did, that they show a love for reading again. And if you miss a few days, please don’t get discouraged. There will be weeks when I realize we have rarely read and I do my best not to get down or discouraged. It’s the consistent and cumulative effort in the long run. If you get down on yourself every time you and your kids miss a reading time, reading time will be less fun. Do your best and enjoy the sweet bonding time you have with them while reading books aloud together. Start reading series together as the kids grow older. It will be fun for them to get ‘into the books’ and want to start reading more. I know as a teen when I got into series: Anne of Green Gables, Harry Potter, etc. I just wanted to read and read and read. Thanks for the tip! Doing these 33 things (a few or even all of them) will help your baby, toddler, or young child learn to love to read. What do you do to instill a love for reading in your children? Please comment below. For other ‘rich living’ tips and DIY projects, please subscribe, like me on Facebook, and follow me on Pinterest. Linked up at What’s Cooking Love, Posed Perfection, The Pin Junkie, Saving 4 Six, Artsy-Fartsy Mama, Tidy Mom, Tatertots & Jello. and An Italian in My Kitchen. These are such awesome ideas! We do a lot of them, but some I haven’t thought of. My son is super into reading, and usually my daughter will sit with us but sometimes she gets bored and wanders. 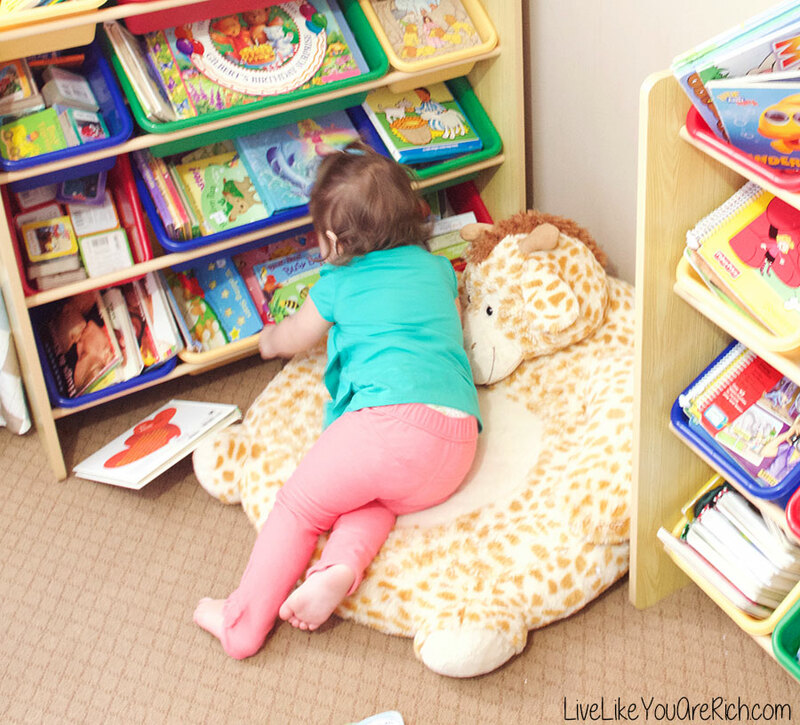 We do have books in their playroom and she is always pulling them down and looking at them! Thanks for these tips! You’re welcome Chelsea! Thank you for stopping by. I’m so glad your kids love reading. It’s so fun! 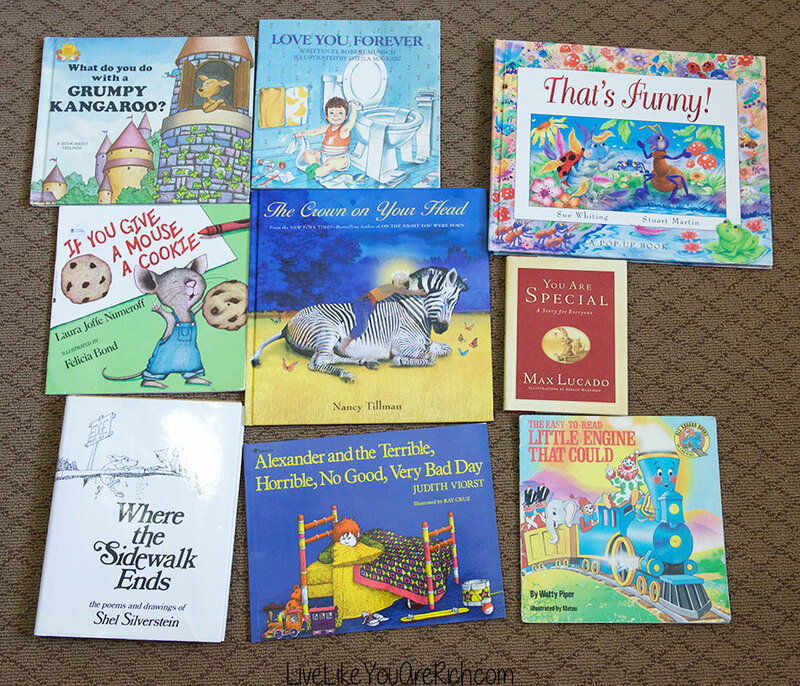 These are some great ideas to get kids reading! It’s so important to get them into the habit of reading at a young age. Plus it’s a great way to bond! Love all your ideas. We do some of them, but I will include others you mention. We’ve been reading The Guardians of Childhood series from William Joyce, and they love how the story continues from one book to another, actually this made my 7 year old son want to start another series all by himself. Thank you for taking the time of sharing your ideas. What an excellent idea to begin reading series together as they grow a little older! I’ll add this to the list. Thank you! I love these! Reading is so important to me, and I truly think its because my parents put a really heavy focus on it when I was young. Pinning and stumbling, thank you for sharing! I started reading to my two children the day I brought them home from the hospital. My mom used to think this silly, but my children grew up loving books. A love of reading is the best gift we can give our children. It will help them in everything they do in life. My children are now 21 & 18. When we could, we use to have “reading days”. We would stay in our pjs, sit together in beanbag chairs, make popcorn and hot chocolate. We would read to each other for hours. We all have very fond memories of our “reading days”. I’m so glad your kids love reading. Thanks for stopping by.